The Miami Dolphins presumably have their starting quarterback for 2019, agreeing to terms on a two-year deal with Ryan Fitzpatrick Sunday, according to Adam Schefter. The 36-year-old Fitzpatrick, who spent the last two seasons with the Buccaneers, will join his eighth NFL franchise. The Dolphins more or less had to find a new starting quarterback after trading incumbent starter Ryan Tannehill to Tennessee earlier this week, leaving them with a depth chart of Luke Falk and Jake Rudock, and in Fitzpatrick they got … basically the bare minimum they could have. Fitzpatrick is definitely still an NFL-caliber player — he was the No. 10 graded quarterback in 2018 at 84.4 in intermittent time with Tampa Bay — but he doesn’t offer much in the way of NFL upside for a Miami roster that is drawing plenty of “tank” whispers. That said, Fitzpatrick is not without fantasy potential. He was comfortably the top fantasy quarterback in Weeks 1 and 2 in 2018, 6.1 points ahead of Patrick Mahomes and 20.3 ahead of everyone else, and put up 145.2 points in the five games he started and finished across the season, a 29.0-point average that would have led the league across 16 games. The problem is that caveat up there. “Started and finished.” The Buccaneers went back and forth between Fitzpatrick and Jameis Winston multiple times in 2018, with Winston relieving Fitzpatrick in poor performances in Weeks 4 and 11 and Fitzpatrick coming in for Winston in Week 8. That’s who Fitzpatrick is, though. He had a 42-point game in Week 1 of 2018, and has had at least a 30-point game in four different seasons, including a six-touchdown game in 2014. But for six-TD game, there was a six-interception game in 2016, and for every 40-point game, there was a two-point outing. 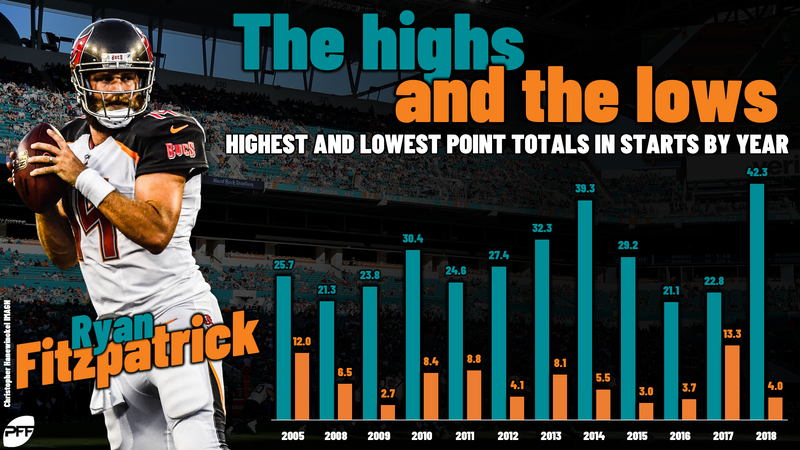 Not many quarterbacks have the fantasy highs of Fitzpatrick, but not many have his lows either. The Dolphins probably don’t care too much about this, though. The team appears fully committed to a plan that will have them in line to ostensibly draft Alabama quarterback Tua Tagovailoa a year from now, which means all they needed for 2019 was a warm body. Fitzpatrick will do the job and will offer DFS tournament upside in some games in the process. For Dolphins receivers, the primary beneficiary of this move is likely Kenny Stills, the team’s primary deep threat who has had an average depth of target over 15 yards each of his four years in Miami. Fitzpatrick’s aDOT was two yards deeper than Tannehill’s last year and has been deeper than Tannehill’s every year since Fitzpatrick was on the Titans back in 2013. Pairing Stills with Fitzpatrick won’t make a top-10 fantasy receiver, but he’ll carry real best ball upside and probably be a low-end flex in redraft leagues. After Stills, the move keeps the perpetually almost-but-not-quite-interesting DeVante Parker vaguely on the radar, though the one-time first-rounder still hasn’t even reached 10 career touchdowns across his four seasons and was barely used in 2018. Albert Wilson, coming back from an ACL tear, loses some appeal with his move. As for Fitzpatrick himself, he’ll be that aforementioned DFS tournament option in any given week, and he’s interesting as a No. 2 or 3 best ball quarterback. In season-long leagues, though, he’s not worth a lot, with the lows hurting at least as much as the highs will help. He’s probably worth a flyer in super-deep and/or two-QB leagues, but beyond that it’s better to avoid his risk.